(MIlwaukee, Wis.) During the beleaguered years of the First Armenian Republic (1918-1920), two Americans traveled the length of the country in a rickety motorcar over unpaved roads on a mission to aid the refugees. They may have saved as many as 100,000 lives and left behind a priceless documentary record of the Genocide. 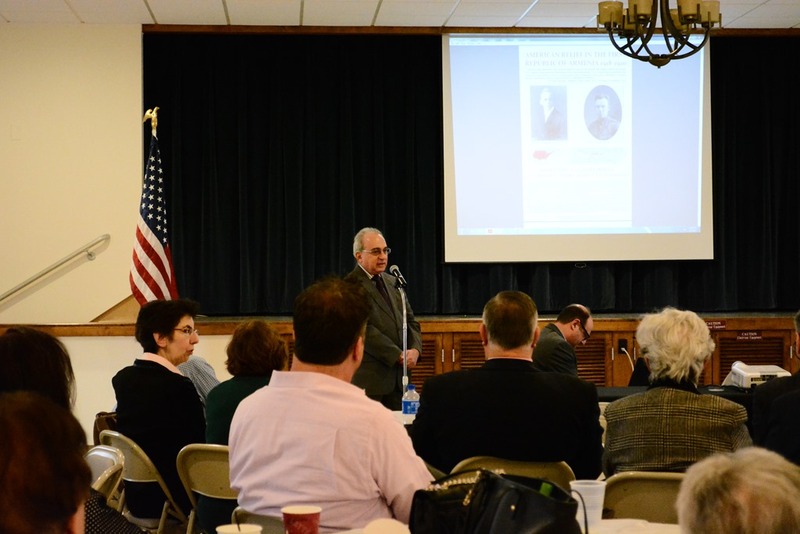 On Sunday, April 7, Dr. Rouben Adalian, Director of the Armenian National Institute in Washington DC, spoke at St. John the Baptist Armenian Church about those two Americans, John Elder and James Arroll. They were YMCA volunteers, initially sent to Russia to boost morale in America’s World War I ally. With the rise of the Bolsheviks, Elder and Arroll found themselves in Russian Armenia. The challenges they faced were catastrophic in scale. From May through October 1918, Elder and Arroll witnessed the carnage as Turkish forces drove across the border into the fragile Armenian Republic. The YMCA volunteers organized relief in Armenia as part of an overall American effort to aid millions of hungry and displaced people across Europe and the Near East, yet Elder and Arroll had fewer assets at their disposal than their counterparts in Belgium and other countries. For many months they were the only Americans in Armenia and served as their country’s unofficial representatives to the republic. The resources they worked with were slender. They established an orphanage consisting of nothing more than an empty room without beds or furnishings of any kind, only a roof to keep out the rain. Elder and Arroll were also responsible for a trove of photographs showing the ravaged faces and emaciated bodies of refugees, the mass graves and the decimated towns left by the retreating Turks. One especially chilling image, displayed by Adalian in PowerPoint, shows a woman picking a dirt field looking for scraps of food. Elder and Arroll’s work was long forgotten until Adalian, who earned a Ph.D in history under Richard Hovannisian, pieced together their story. However, as he conceded, many things remain unknown about the pair of humanitarian adventurers who played a decisive but unsung role in assisting Armenia during a time of great peril.